STAT is featuring a wonderful series called the Game of Genomes. In this series, Carl Zimmer, a journalist, had his full genome sequenced AND managed to obtain the BAM file – which is no small feat. If you want to know why, you’ll need to read the article where he describes this saga. Graduate students poured over his results, and then met with Carl to tell him what they found. The great thing about this article is that, first, Carl writes about this extremely technical topic in a way that is understandable and interesting for normal air-breathing humans. No graduate degree required. Second, and the part I find fascinating, is that Carl’s experience lets us peek beneath the hood into the underpinnings of the world of genomic sequencing along with giving us a periscopic view into the future. Most people don’t realize we’re still on the frontier. Carl is on the very edge of that frontier. You can read the series here. Keep scrolling for episodes – below the graphics. To date, 5 episodes have been published. At the end, you can sign up for the next episode. Lastly, you can view the Supplemental Materials produced by the various labs here. Those are fascinating as well – but more technical in nature. Carl was told that he had 3,559,137 “differences” when compared to the reference human genome. Difference = mutation. Some of those differences could be protective, some could be carriers of disease, meaning they don’t affect Carl but would affect a child if his wife also carried that mutation, some could be harmless, some could be disease producing, and some could be deadly. These differences have the potential to represent the full range of outcomes – and along with the outcomes – the full range of emotional terror – from nothing to full blown panic attack. Carl also has some “broken genes.” We all do. Mostly, they don’t matter…but some could, would and do. Carl’s apparently don’t – at least not much. Would you want to know only if there was something that could be done? Would this depress you or help you to plan your life more effectively? Would this knowledge cause you anxiety or empower you? Maybe even inspire you? Keep in mind that what we think we know today is often revised tomorrow – especially on the leading, sometimes bleeding, edge. Having worked on the leading edge of technology for 30+ years and genetic genealogy for 15+, I can tell you that I would jump at this opportunity in a heartbeat. I must carry two copies of the “incessant compulsion to learn” gene! This week has seen a flurry of new scientific and news articles. What has been causing such a stir? It appears that Australian or more accurately, Australo-Melanese DNA has been found in South America’s Native American population. In addition, it has also been found in Aleutian Islanders off the coast of Alaska. In case you aren’t aware, that’s about 8,500 miles as the crow flies. That’s one tired crow. As the person paddles or walks along the shoreline, it’s even further, probably about 12,000 miles. Whatever the story, it was quite a journey and it certainly wasn’t all over flat land. This isn’t the first inkling we’ve had. Just a couple weeks ago, it was revealed that the Botocudo remains from Brazil were Polynesian and not admixed with either Native, European or African. This admixture was first discovered via mitochondrial DNA, but full genome sequencing confirmed their ancestry and added the twist that they were not admixed – an extremely unexpected finding. This is admittedly a bit confusing, because it implies that there were new Polynesian arrivals in the 1600s or 1700s. Unlikely as it seems, it obviously happened, so we set that aside as relatively contemporary. The findings in the papers just released are anything but contemporary. This article in EurekAlert and a second one here discuss the Science paper. Migration map from the Raghaven paper. The paper included the gene flow and population migration map, above, along with dates. The researchers also state that they utilized 17 specimens from relict groups such as the Pericues from Mexico and Fuego-Patagonians from the southernmost tip of South America. They also sequenced two pre-Columbian mummies from the Sierra Tarahumara in northern Mexico. In total, 23 ancient samples from the Americas were utilized. They then compared these results with a reference panel of 3053 individuals from 169 populations which included the ancient Saqqaq Greenland individual at 400 years of age as well as the Anzick child from Montana from about 12,500 years ago and the Mal’ta child from Siberia at 24,000 years of age. Not surprisingly, all of the contemporary samples with the exception of the Tsimshian genome showed recent western Eurasian admixture. As expected, the results confirm that the Yupik and Koryak are the closest Eurasian population to the Americas. They indicate that there is a “clean split” between the Native American population and the Koryak about 20,000 years ago. Evidence of gene flow between the two groups was also found, meaning between the Athabascans and the Inuit. Additionally, they found evidence of post-split gene flow between Siberians and Native Americans which seems to have stopped about 12,000 years ago, which meshes with the time that the Beringia land bridge was flooded by rising seas, cutting off land access between the two land masses. They state that the results support all Native migration from Siberia, contradicting claims of an early migration from Europe. The researchers then studied the Karitiana people of South America and determined that the two groups, Athabascans and Karitiana diverged about 13,000 years ago, probably not in current day Alaska, but in lower North America. This makes sense, because the Clovis Anzick child, found in Montana, most closely matches people in South America. By the Clovis period of about 12,500 years ago, the Native American population had already split into two branches, the northern and southern, with the northern including Athabascan and other groups such as the Chippewa, Cree and Ojibwa. The Southern group included people from southern North America and Central and South America. Interestingly, while admixture with the Inuit was found with the Athabascan, Inuit admixture was not found among the Cree, Ojibwa and Chippewa. The researchers suggest that this may be why the southern branch, such as the Karitiana are genetically closer to the northern Amerindians located further east than to northwest coast Amerindians and Athabascans. Finally, we get to the Australian part. The researchers when trying to sort through the “who is closer to whom” puzzle found unexpected results. They found that some Native American populations including Aleutian Islanders, Surui (Brazil) and Athabascans are closer to Australo-Melanesians compared to other Native Americans, such as Ojibwa, Cree and Algonquian and South American Purepecha (Mexico), Arhuaco (Colombia) and Wayuu (Colombia, Venezuela). In fact, the Surui are one of the closest populations to East Asians and Australo-Melanese, the latter including Papuans, non-Papuan Melanesians, Solomon Islanders and hunter-gatherers such as Aeta. The researchers acknowledge these are weak trends, but they are nonetheless consistently present. Dr. David Reich, from Harvard, a co-author of another paper, also published this past week, says that 2% of the DNA of Amazonians is from Oceana. If that is consistent, it speaks to a founder population in isolation, such that the 2% just keeps getting passed around in the isolated population, never being diluted by outside DNA. I would suggest that is not a weak signal. The researchers suggest that the variance in the strength of this Oceanic signal suggests that the introduction of the Australo-Melanese occurred after the initial peopling of the Americas. The ancient samples cluster with the Native American groups and do not show the Oceanic markers and show no evidence of gene flow from Oceana. The researchers also included cranial morphology analysis, which I am omitting since cranial morphology seems to have led researchers astray in the past, specifically in the case of Kennewick man. One of the reasons cranial morphology is such a hotly debated topic is because of the very high degree of cranial variance found in early skeletal remains. One of the theories evolving from the cranial differences involving the populating of the Americans has been that the Australo-Melanese were part of a separate and earlier migration that gave rise to the earliest Americans who were then later replaced by the Asian ancestors of current day Native Americans. If this were the case, then the now-extinct Fuego-Patagonains samples from the location furthest south on the South American land mass should have included DNA from Oceana, but it didn’t. A second article published this week, titled “’Ghost population’ hints at long lost migration to the Americas” by Ellen Callaway discusses similar findings, presented in a draft letter to Nature titled “Genetic evidence for two founding populations of the Americas” by Skoglund et al. This second group discovers the same artifact Australo-Melanesian DNA in Native American populations but suggests that it may be from the original migration and settlement event or that there may have been two distinct founding populations that settled at the same time or that there were two founding events. EurekAlert discusses the article as well. It’s good to have confirmation and agreement between the two labs who happened across these results independently that the Australo-Melanesian DNA is present in some Native populations today. Their interpretations and theories about how this Oceanic DNA arrived in some of the Native populations vary a bit, but if you read the details, it’s really not quite as different as it first appears from the headlines. Neither group claims to know for sure, and both discuss possibilities. Questions remain. For example, if the founding group was small, why, then, don’t all of the Native people and populations have at least some Oceanic markers? The Anzick Child from 12,500 years ago does not. He is most closely related to the tribes in South America, where the Oceanic markers appear with the highest frequencies. In the Harvard study, the scientists fully genome sequenced 63 individuals without discernable evidence of European or African ancestors in 21 Native American populations, restricting their study to individuals from Central and South America that have the strongest evidence of being entirely derived from a homogenous First American ancestral population. Their results show that the two Amazonian groups, Surui and Karitians are closest to the “Australasian populations, the Onge from the Andaman Island in the Bay of Bengal (a so-called ‘Negrito’ group), New Guineans, Papuans and indigenous Australians.” Within those groups, the Australasian populations are the only outliers – meaning no Africans, Europeans or East Asian DNA found in the Native American people. When repeating these tests, utilizing blood instead of saliva, a third group was shown to also carry these Oceanic markers – the Xavante, a population from the Brazilian plateau that speaks a language of the Ge group that is different from the Tupi language group spoke by the Karitians and Surui. The closest populations that these Native people matched in Oceana, shown above on the map from the draft Skoglund letter, were, in order, New Guineans, Papuans and Andamanese. The researchers further state that populations from west of the Andes or north of the Panama isthmus show no significant evidence of an affinity to the Onge from the Andaman Islands with the exception of the Cabecar (Costa Rica). That’s a very surprising finding, given that one would expect more admixture on the west, which is the side of the continent where the migration occurred. The researchers then compared the results with other individuals, such as Mal’ta child who is known to have contributed DNA to the Native people today, and found no correlation with Oceanic DNA. Therefore, they surmised that the Oceanic admixture cannot be explained by a previously known admixture event. They propose that a mystery population they have labeled as “Population Y” (after Ypykuera which means ancestor in the Tupi language family) contributed the Australasian lineage to the First Americans and that is was already mixed into the lineage by the time it arrived in Brazil. According to their work, Population Y may itself have been admixed, and the 2% of Oceanic DNA found in the Brazilian Natives may be an artifact of between 2 and 85% of the DNA of the Surui, Karitiana and Xavante that may have come from Population Y. They mention that this result is striking in that the majority of the craniums that are more Oceanic in Nature than Asiatic, as would be expected from people who migrated from Siberia, are found in Brazil. They further state they find no admixture indication that would suggest that Population Y arrived in the last few thousand years. So, it appears that perhaps the Neanderthals and Denisovans were not the only people who were our ancestors, but no longer exist as a separate people, only as an admixed part of us today. We are their legacy. When I did the Anzick extractions, we had hints that something of this sort might have been occurring. For example, I found surprising instances of haplogroup M, which is neither European, African nor Native American, so far as we know today. This may have been a foreshadowing of this Oceanic admixture. It may also be a mitochondrial artifact. Time will tell. Perhaps haplogroup M will turn out to be Native by virtue of being Oceanic and admixed thousands of years ago. There is still a great deal to learn. Regardless of how these haplogroups and Oceanic DNA arrived in Brazil in South America and in the Aleutian Islands off of Alaska, one thing is for sure, it did. We know that the Oceanic DNA found in the Brazilian people studied for these articles is not contemporary and is ancient. This means that it is not related to the Oceanic DNA found in the Botocudo people, who, by the way, also sport mitochondrial haplogroups that are within the range of Native people, meaning haplogroup B, but have not been found in other Native people. Specifically, haplogroups B4a1a1 and B4a1a1a. Additionally, there are other B4a1a, B4a1b and B4a1b1 results found in the Anzick extract which could also be Oceanic. You can see all of the potential and confirmed Native American mitochondrial DNA results in my article “Native American Mitochondrial Haplogroups” that I update regularly. We don’t know how or when the Botocudo arrived, but the when has been narrowed to the 1600s or 1700s. We don’t know how or when the Oceanic DNA in the Brazilian people arrived either, but the when was ancient. This means that Oceanic DNA has arrived in South America at least twice and is found among the Native peoples both times. We know that some Native groups have some Oceanic admixture, and others seem to have none, in particular the Northern split group that became the Cree, Ojibwa, Algonquian, and Chippewa. We know that the Brazilian Native groups are most closely related to Oceanic groups, but that the first paper also found Oceanic admixture in the Aleutian Islands. The second paper focused on the Central and South American tribes. We know that the eastern American tribes, specifically the Algonquian tribes are closely related to the South Americans, but they don’t share the Oceanic DNA and neither do the mid-continent tribes like the Cree, Ojibwa and Chippewa. The only Paleolithic skeleton that has been sequenced, Anzick, from 12,500 years ago in Montana also does not carry the Oceanic signature. In my opinion, the disparity between who does and does not carry the Oceanic signature suggests that the source of the Oceanic DNA in the Native population could not have been a member of the first party to exit out of Beringia and settle in what is now the Americas. Given that this had to be a small party, all of the individuals would have been thoroughly admixed with each other’s ancestral DNA within just a couple of generations. It would have been impossible for one ancestor’s DNA to only be found in some people. To me, this argues for one of two scenarios. First, a second immigration wave that joined the first wave but did not admix with some groups that might have already split off from the original group such as the Anzick/Montana group. Second, multiple Oceanic immigration events. We still have to consider the possibility that there were multiple events that introduced Oceanic DNA into the Native population. In other words, perhaps the Aleutian Islands Oceanic DNA is not from the same migration event as the Brazilian DNA which we know is not from the same event as the Botocudo. I would very much like to see the Oceanic DNA appear in a migration path of people, not just in one place and then the other. We need to connect the dots. What this new information does is to rule out the possibility that there truly was only one wave of migration – one group of people who settled the Americas at one time. More likely, at least until the land bridge submerged, is that there were multiple small groups that exited Beringia over the 8,000 or so years it was inhabitable. Maybe one of those groups included people from Oceana. Someplace, sometime, as unlikely as it seems, it happened. The amazing thing is that it’s more than 10,000 miles from Australia to the Aleutian Islands, directly across the Pacific. Early adventurers would have likely followed a coastal route to be sustainable, which would have been significantly longer. The fact that they survived and sent their DNA on a long adventure from Australia to Alaska to South America – and it’s still present today is absolutely amazing. We know we still have a lot to learn and this is the tip of a very exciting iceberg. As more contemporary and ancient Native people have their full genomes sequenced, we’ll learn more answers. The answer is in the DNA. We just have to sequence enough of it and learn how to understand the message being delivered. Today, in Nature, a team of scientists released information about the full genomic sequencing of Kennewick Man who was discovered in 1996 in Washington state. Previous DNA sequencing attempts had failed, and 8000 year old Kennewick Man was then embroiled in years of legal battles. Ironically, the only reason DNA testing was allowed is because, based on cranial morphology it was determined that he was likely more closely associated with Asian people or the Auni than the Native American population, and therefore NAGPRA did not apply. However, subsequent DNA testing has removed all question about Kennewick Man’s history. He truly is the Ancient One. Kennewick man is Native American. His Y haplogroup is Q-M3 and his mitochondrial DNA is X2a. This autosomal DNA was analyzed as well, and compared to some current tribes, where available. Beginning with the full sequencing of the Neanderthal genome, first published in May 2010 by the Max Planck Institute with Svante Paabo at the helm, and followed shortly thereafter with a Denisovan specimen, we began to unravel our ancient history. The photo below shows a step in the process of extracting DNA from ancient bones at Max Planck. Our Y and mitochondrial DNA haplogroups take us back thousands of years in time, but at some point, where and how people were settling and intermixing becomes fuzzy. Ancient DNA can put the people of that time and place in context. We have discovered that current populations do not necessarily represent the ancient populations of a particular locale. Recent information discovered from ancient burials tells us that the people of Europe descend from a 3 pronged model. Until recently, it was believed that Europeans descended from Paleolithic hunter-gatherers and Neolithic farmers, a two-pronged model. Previously, it was believed that Europe was peopled by the ancient hunter-gatherers, the Paleolithic, who originally settled in Europe beginning about 45,000 years ago. At this time, the Neanderthal were already settled in Europe but weren’t considered to be anatomically modern humans, and it was believed, incorrectly, that the two groups did not interbreed. These hunter-gatherers were the people who settled in Europe before the last major ice age, the Younger Dryas, taking refuge in the southern portions of Europe and Eurasia, and repeopling the continent after the ice receded, about 12,000 years ago. By that time, the Neanderthals were gone, or as we now know, at least partially assimilated. This graphic shows Europe during the last ice age. The second settlement wave, the agriculturalist farmers from the Near East either overran or integrated with the hunter-gatherers in the Neolithic period, depending on which theory you subscribe to, about 8000-10,000 years ago. Beginning in 2012, we began to see hints of a third lineage that contributed to the peopling of Europe as well, from the north. Buried in the 2012 paper, Estimating admixture proportions and dates with ADMIXTOOLS by Patterson et al, was a very interesting tidbit. This new technique showed a third population, referred to by many as a “ghost population”, because no one knew who they were, that contributed to the European population. The new population was termed Ancient North Eurasian, or ANE. Dienekes covered this paper in his blog, but without additional information, in the community in general, there wasn’t much more than a yawn. The first real hint of meat on the bones of ANE came in the form of ancient DNA analysis of a 24,000 year old Siberian boy that has come to be named Mal’ta (Malta) Child. In the original paper, by Raghaven et al, Upper Palaeolithic Siberian genome reveals dual ancestry of Native Americans, he was referred to as MA-1. I wrote about this in my article titled Native American Gene Flow – Europe?, Asia and the Americas. Dienekes wrote about this paper as well. This revelation caused quite a stir, because it was reported that the Ancestor of Native Americans in Asia was 30% Western Eurasian. Unfortunately, in some cases, this was immediately interpreted to mean that Native Americans had come directly from Europe which is not what this paper said, nor inferred. It was also inferred that the haplogroups of this child, R* (Y) and U (mtDNA) were Native American, which is also incorrect. To date, there is no evidence for migration to the New World from Europe in ancient times, but that doesn’t mean we aren’t still looking for that evidence in early burials. What this paper did show was that Europeans and Native Americans shared a common ancestor, and that the Siberian population had contributed to the European population as well as the Native American population. In other words, descendants settled in both directions, east and west. The most fascinating aspect of this paper was the match distribution map, below, showing which populations Malta child matched most closely. As you can see, MA-1, Malta Child, matches the Native American population most closely, followed by the northern European and Greenland populations. The further south in Europe and Asia, the more distant the matches and the darker the blue. Last fall at the Family Tree DNA conference, Dr. Michael Hammer, from the Hammer Lab at the University of Arizona discussed new findings relative to ancient burials, specifically in relation to haplogroup R, or more specifically, the absence of haplogroup R in those early burials. Based on the various theories and questions, ancient burials were enlightening. In 2013, there were a total of 32 burials from the Neolithic period, after farmers arrived from the Near East, and haplogroup R did not appear. Instead, haplogroups G, I and E were found. What this tells us is that haplogroup R, as well as other haplogroup, weren’t present in Europe at this time. Having said this, these burials were in only 4 locations and, although unlikely, R could be found in other locations. Last year, Dr. Hammer concluded that haplogroup R was not found in the Paleolithic and likely arrived with the Neolithic farmers. That shook the community, as it had been widely believed that haplogroup R was one of the founding European haplogroups. While this provided tantalizing information, we still needed additional evidence. No paper has yet been published that addresses these findings. The mass full sequencing of the Y chromosome over this past year with the introduction of the Big Y will provide extremely valuable information about the Y chromosome and eventually, the migration path into and across Europe. In September 2014, another paper was published by Lazaridis et al that more fully defined this new ANE branch of the European human family tree. An article in BBC News titled Europeans drawn from three ancient ‘tribes’ describes it well for the non-scientist. Of particular interest in this article is the artistic rendering of the ancient individual, based on their genetic markers. You’ll note that they had dark skin, dark hair and blue eyes, a rather unexpected finding. The paper, Ancient human genomes suggest three ancestral populations for present-day Europeans, appeared as a letter in Nature and is behind a paywall, but the supplemental information is free. We sequenced the genomes of a ~7,000-year-old farmer from Germany and eight ~8,000-year-old hunter-gatherers from Luxembourg and Sweden. We analysed these and other ancient genomes1, 2, 3, 4 with 2,345 contemporary humans to show that most present-day Europeans derive from at least three highly differentiated populations: west European hunter-gatherers, who contributed ancestry to all Europeans but not to Near Easterners; ancient north Eurasians related to Upper Palaeolithic Siberians3, who contributed to both Europeans and Near Easterners; and early European farmers, who were mainly of Near Eastern origin but also harboured west European hunter-gatherer related ancestry. We model these populations’ deep relationships and show that early European farmers had ~44% ancestry from a ‘basal Eurasian’ population that split before the diversification of other non-African lineages. This paper utilized ancient DNA from several sites and composed the following genetic contribution diagram that models the relationship of European to non-European populations. For anyone interested in ancient DNA, 2014 has been a banner years. At the Family Tree DNA conference in Houston, Texas, Dr. Michael Hammer brought the audience up to date on Europe’s ancestral population, including the newly sequenced ancient burials and the information they are providing. Dr. Hammer said that ancient DNA is the key to understanding the historical processes that led up to the modern. He stressed that we need to be careful inferring that the current DNA pattern is reflective of the past because so many layers of culture have occurred between then and now. Until recently, it was assumed that the genes of the Neolithic farmers replaced those of the Paleolithic hunter-gatherers. Ancient DNA is suggesting that this is not true, at least not on a wholesale level. The theory, of course, is that we should be able to see them today if they still exist. The migration and settlement pattern in the slide below was from the theory set forth in the 1990s. In 2013, Dr. Hammer discussed the theory that haplogroup R1b spread into Europe with the farmers from the Near East in the Neolithic. This year, he expanded upon that topic that based on the new findings from ancient burials. Last year, Dr. Hammer discussed 32 burials from 4 sites. Today, we have information from 15 ancient DNA sites and many of those remains have been full genome sequenced. Scientists are finding a signal of northeast Asian related admixture in northern Europeans, first suggested in 2012. This was confirmed with the sequencing of Malta child and then in a second sequencing of Afontova Gora2 in south central Siberia. We have complete genomes from nine ancient Europeans – Mesolithic hunter gatherers and Neothilic farmers. Hammer refers to the Mesolithic here, which is a time period between the Paleolithic (hunter gatherers with stone tools) and the Neolithic (farmers). In the PCA charts, shown above, you can see that Europeans and people from the Near East cluster separately, except for a bridge formed by a few Mediterranean and Jewish populations. On the slide below, the hunter-gatherers (WHG) and early farmers (EEF) have been overlayed onto the contemporary populations along with the MA-1 (Malta Child) and AG2 (Afontova Gora2) representing the ANE. When sequenced, separate groups formed including western hunter gathers and early european farmers include Otzi, the iceman. A third group is the north south clinal variation with ANE contributing to northern European ancestry. The groups are represented by the circles, above. Dr. Hammer said that the team who wrote the “Ancient Human Genomes” paper just recently published used an F3 test, results shown above, which shows whether populations are an admixture of a reference population based on their entire genome. He mentioned that this technique goes well beyond PCA. Mapped onto populations today, most European populations are a combination of the three early groups. However, the ANE is not found in the ancient Paleolithic or Neolithic burials. It doesn’t arrive until later. This tells us that there was a migration event 45,000 years ago from the Levant, followed about 7000 years ago by farmers from the Near East, and that ANE entered the population some time after that. All Europeans today carry some amount of ANE, but ancient burials do not. These burials also show that southern Europe has more Neolithic farmer genes and northern Europe has more Paleolithic/Mesolithic hunter-gatherer genes. Pigmentation for light skin came with farmers – blue eyes existed in hunter gatherers even though their skin was dark. Dr. Hammer created these pie charts of the Y and mitochondrial haplogroups found in the ancient burials as compared to contemporary European haplogroups. The pie chart on the left shows the haplogroups of the Mesolithic burials, all haplogroup I2 and subclades. Note that in the current German population today, no I2a1b and no I1 was found. The chart on the right shows current Germans where haplogroup I is a minority. Therefore, we can conclude that haplogroup I is a good candidate to be identified as a Paleolithic/Mesolithic haplogroup. This information shows that the past is very different from today. In 2014 we have many more burials that have been sequenced than last year, as shown on the map above. Green represents Neolithic farmers, red are Mesolithic hunter-gatherers, brown at bottom right represents more recent samples from the Metallic age. There are a total of 48 Neolithic burials where haplogroup G dominates. In the Mesolithic, there are a total of six haplogroup I. This suggests that haplogroup I is a good candidate to be the father of the Paleolithic/Mesolithic and haplogroup G, the founding father of the Neolithic. In addition to haplogroup G in the Neolithic, one sample of both E1b1b1 (M35) and C were also found in Spain. E1b1b1 isn’t surprising given it’s north African genesis, but C was quite interesting. The Metal ages, which according to wiki begin about 3300BC in Europe, is where haplogroup R, along with I1, first appear. Please note that the diffusion of melallurgy map above is not part of Dr. Hammer’s presentation. I have added it for clarification. Nothing is constant in Europe. The Y DNA was very upheaved, as indicated on the graphic above. Mitochondrial DNA shifted from pre-Neolithic to Neolithic which isn’t terribly different from the present day. Dr. Hammer did not say this, but looking at the Y versus the mtDNA haplogroups, I wonder if this suggests that indeed there was more of a replacement of the males in the population, but that the females were more widely assimilated. This would certainly make sense, especially if the invaders were warriors and didn’t have females with them. They would have taken partners from the invaded population. Haplogroup G represents the spread of farming into Europe. The most surprising revelation is that haplogroup R1b appears to have emerged after the Neolithic agriculture transition. Given that just three years ago we thought that haplogroup R1b was one of the original European settlers thousands of years ago, based on the prevalence of haplogroup R in Europe today, at about 50%, this is a surprising turn of events. Last year’s revelation that R was maybe only 7000-8000 years old in Europe was a bit of a whammy, but the age of R in Europe in essence just got halved again and the source of R1b changed from the Near East to the Asian steppes. Obviously, something conferred an advantage to these R1b men. Given that they arrived in the early Metalic age, was it weapons and chariots that enabled the R1b men who arrived to quickly become more than half of the population? The Bronze Age saw the first use of metal to create weapons. Warrior identity became a standard part of daily life. Celts ranged over Europe and were the most dominant iron age warriors. Indo-European languages and chariots arrived from Asia about this time. The map above shows the Hallstadt and LaTene Celtic cultures in Europe, about 600BC. This was not a slide presented by Dr. Hammer. Haplogroup R1b was not found in an ancient European context prior to a Bell Beaker period burial in Germany 4.8-4.0 kya (thousand years ago, i.e. 4,800-4,000 years ago). R1b arrives about 4.6 kya and is also found in a Corded Ware culture burial in Germany. A late introduction of these lineages which now predominate in Europe corresponds to the autosomal signal of the entry of Asian and Eastern European steppe invaders into western Europe. Local expansion occurred in Europe of R1b subgroups U106, L21 and U152. A current haplogroup R distribution map that reflects the findings of this past year is shown above. Haplogroup I is interesting for another reason. It looks like haplogroup I2a1b (M423) may have been replaced by I1 which expanded after the Mesolithic. On the slide above, the Loschbour sample from Luxembourg was mapped onto a current haplogroup I SNP map where his closest match is a current day Russian. One of the benefits of ancient DNA genome processing is that we will be able to map current trees into maps of old SNPs and be able to tell who we match most closely. Autosomal DNA can also be mapped to see how much of our DNA is from which ancient population. Dr. Hammer mapped the percentages of European Mesolithic/Paleolithic hunter-gatherers in blue, Neolithic Farmers from the Near East in magenta and Asian Steppe Invaders representing ANE in yellow, over current populations. Note the ancient DNA samples at the top of the list. None of the burials except for Malta Child carry any yellow, indicating that the ANE entered the European population with the steppe invaders; the same group that brought us haplogroup R and possibly I1. Dr. Hammer says that ANE was introduced to and assimilated into the European population by one or more incursions. We don’t know today if ANE in Europeans is a result of a single blast event or multiple events. He would like to do some model simulations and see if it is related to timing and arrival of swords and chariots. We know too that there are more recent incursions, because we’re still missing major haplogroups like J. The further east you go, meaning the closer to the steppes and Volga region, the less well this fits the known models. In other words, we still don’t have the whole story. At the end of the presentation, Michael was asked if the whole genomes sequenced are also obtaining Y STR data, which would allow us to compare our results on an individual versus a haplogroup level. He said he didn’t know, but he would check. Family Tree DNA was asked if they could show a personal ancient DNA map in myOrigins, perhaps as an alternate view. Bennett took a vote and that seemed pretty popular, which he interpreted as a yes, we’d like to see that. The advent of and subsequent drop in the price of whole genome sequencing combined with the ability to extract ancient DNA and piece it back together have provided us with wonderful opportunities. I think this is jut the proverbial tip of the iceberg, and I can’t wait to learn more. Ancient DNA Matches – What Do They Mean? This slide, by Robert Baber, pretty well sums up our group obsession and what we focus on every year at the Family Tree DNA administrator’s conference in Houston, Texas. Getting to Houston, this year, was a whole lot easier than getting out of Houston. They had storms yesterday and many of us spent the entire day becoming intimately familiar with the airport. Jennifer Zinck, of Ancestor Central, is still there today and doesn’t have a flight until late. So far, today hasn’t improved any, so let’s talk about something much more pleasant…the conference itself. One of the reasons I mentioned Jennifer Zinck, aside from the fact that she’s still stuck in the airport, is because she did a great job actually covering the conference as it happened. Since I had some time yesterday to visit with her since our gates weren’t terribly far apart, I asked her how she got that done. I took notes too, and photos, but she turned out a prodigious amount of work in a very short time. While I took a lightweight MacBook Air, she took her regular PC that she is used to typing on, and she literally transcribed as the sessions were occurring. She just added her photos later, and since she was working on a platform that she was familiar with, she could crop and make the other adjustments you never see but we perform behind the scenes before publishing a photo. On the other hand, I struggled with a keyboard that works differently and is a different size than I’m used to as well as not being familiar with the photo tools to reduce the size of pictures, so I just took rough notes and wrote the balance later. Having familiar tools make such a difference. I think I’ll carry my laptop from now on, even though it is much heavier. Kudos to Jennifer! I was initially going to summarize each session, but since Jen did such a good job, I’m posting her links. No need to recreate a wheel that doesn’t need to be recreated. ISOGG, the International Society of Genetic Genealogy is not affiliated with Family Tree DNA or any testing company, but Family Tree DNA is generous enough to allow an ISOGG meeting on Sunday before the first conference session. Several people were also posting on a twitter feed as well. Those of you where are members of the ISOGG Yahoo group for project administrators can view photos posted by Katherine Borges in that group and there are also some postings on the Facebook ISOGG group as well. Now that you have the links for the summaries, what I’d like to do is to discuss some of the aspects I found the most interesting. When I attended my first conference 10 years ago, I somehow thought that for the most part, the same group of people would be at the conferences every year. Some were, and in fact, a handful of the 160+ people attending this conference have attended all 10 conferences. I know of two others for certain, but there were maybe another 3 or so who stood up when Bennett asked for everyone who had been present at all 10 conferences to stand. Some of the original conference group has passed on to the other side where I’m firmly convinced that one of your rewards is that you get to see all of those dead ends of your tree. If we’re lucky, we get to meet them as well and ask all of those questions we have on this side. We remember our friends fondly, and their departure sadly, but they enriched us while they were here and their memories make us smile. I’m thinking specifically of Kenny Hedgepath and Leon Little as I write this, but there have been others as well. The definition of a community is that people come and go, births, deaths and moves. This year, about half of the attendees had never attended a conference before. I was very pleased to see this turn of events – because in order to survive, we do need new people who are as crazy as we are…er….I mean as dedicated as we are. ISOGG traditionally hosts a potluck reception on Saturday evening. Lots of putting names with faces going on here. I asked people about their favorite part of the conference or their favorite session. I was surprised at the number of people who said lunches and dinners. Trust me, the food wasn’t that wonderful, so I asked them to elaborate. In essence, the most valuable aspect of the conference was working with and talking to other administrators. I agree, as well. I had pre-arranged two dinners before arriving in order to talk with people with whom I share specific interests. At lunches, I either tried to sit with someone I specifically needed to talk to, or I tried to meet someone new. I also asked people about their specific goals for the next year. Some people had a particular goal in mind, such as a specific brick wall that needs focus. Some, given that we are administrators, had wider-ranging project based goals, like Big Y testing certain family groups, and a surprising number had the goal of better utilizing the autosomal results. Perhaps that’s why there were two autosomal sessions, an introduction by Jim Bartlett and then Tim Janzen’s more advanced session. Note the cool double helix light fixture behind the speakers. Tim specifically mentioned two misconceptions which I run across constantly. Misconception 1 – A common surname means that’s how you match. Just because you find a common surname doesn’t mean that’s your DNA match. This belief is particularly prevalent in the group of people who test at Ancestry.com. Misconception 2 – Your common ancestor has to be within the past 6 generations. Not true, many matches can be 6-10th cousins because there are so many descendants of those early ancestors, even as many as 15 generations back. Tim also mentioned that endogamous relationships are a tough problem with no easy answer. Polynesians, Ashkenazi Jews, Low German Mennonites, Acadians, Amish, and island populations. Do I ever agree with him! I have Brethren, Mennonite and Acadian in the same parent’s line. Tim has been working with the Mennonite DNA project now for many years. Tim included a great resource slide. Tim has graciously made his entire presentation available for download. I will also add that we “mappers” are working with and actively encouraging Family Tree DNA to develop tools so that the mapping is less spreadsheet manual work and more automated, because it certainly can be. If you haven’t already, upload your GEDCOM to Family Tree DNA. This is becoming an essential part of autosomal matching. Furthermore, Family Tree DNA will utilize this file to construct your surname list and that will help immensely determining common surnames and your common ancestor with your Family Finder matches. If you have sponsored tests for cousins, then upload a GEDCOM file for them or at least construct a basic tree on their Family Tree DNA page. Family Tree DNA always tries to provide a speaker about ethics, and the only speakers I’ve ever felt understood anything about what we want to do are Judy Russell and Blaine Bettinger. I was glad to see Blaine presenting this year. The essence of Blaine’s speech is that ethics isn’t about law. Law is cut and dried. Ethics isn’t, and there are no ethics police. Sometimes our decisions are colored necessarily by right and wrong. Sometimes those decisions are more about the difference between a better and a worse way. As a community, we want to reduce negative press coverage and increase positive coverage. We want to be proactive, not reactive. Blaine stresses that while informed consent is crucial, that DNA doesn’t reveal secrets that aren’t also revealed by other genealogical forms of research. DNA often reveals more recent secrets, such as adoptions and NPEs, so it’s possibly more sensitive. Two things need to govern our behavior. First, we need to do only things that we would be comfortable seeing above the fold in the New York Times. Second, understand that we can’t make promises about topics like anonymity or about the absence of medical information, because we don’t know what we don’t know. One of my concerns has been and remains the huge number of new SNPs that have been discovered over the past year or so with the Big Y by Family Tree DNA and corresponding tests from other vendors. When I say concern, I’m thrilled about this new technology and the advances it is allowing us to make as a community to discover and define the evolution of haplogroups. My concern is that the amount of data is overwhelming. However, we are working through that, thanks to the hours and hours of volunteer work by haplogroup administrators and others. Alice Fairhurst, who volunteers to maintain the ISOGG haplotree, mentioned that she has added over 10,000 SNPs to the Y tree this year alone, bringing the total to over 14,000. Those SNPs are fully vetted and placed. There are many more in process and yet more still being discovered. On the first page of the Y SNP tree, the list of SNP sources and other critical information, such as the criteria for a SNP to be listed, is provided. So, if you’re waiting for that next haplotree poster, give it up because there isn’t a printing press that big, unless you want wallpaper. These slides are from Alice’s presentation. The ISOGG tree provides an invaluable resource for not only the genetic genealogy community, but also researchers world-wide. As one example of how the SNP tsunami has affected the Y tree, Alice provided the following summary of R-U106, one of the two major branches of haplogroup R.
From the ISOGG 2006 Y tree, this was the entire haplogroup R Y tree. You can see U106 near the bottom with 3 sub-branches. While this probably makes you chuckle today, remember that 2006 was only 8 years ago and that this tree didn’t change much for several years. 2008 shows 5 subclades and one of the subclades had 2 subclades. 2009 showed a total of 12 sub-branches and 2010 added one more. 2011 however, showed a large change. U106 in 2011 had 44 subgroups total and became too large to show on one screen shot. 2012 shows 99 subclades, if I counted accurately. The 2014 U106 tree is shown below. As you can imagine, for Family Tree DNA, trying to keep up with all of the haplogroups, not just one subgroup like U106 is a gargantuan task that is constantly changing, like hourly. Their Y tree is currently the National Geographic tree, and while they would like to update it, I’m sure, the definition of “current tree” is in a constant state of flux. Literally, Mike Walsh, one of the admins in the R-L21 group uploads a new tree spreadsheet several times every day. In order to deal attempt to deal with this, and to encourage people who don’t want to do a Big Y discovery type test, but do want to ferret out their location on their assigned portion of the tree, Family Tree DNA is reintroducing the Backbone tests. They are starting with M222, also known as the Niall of the 9 Hostages haplogroup which is their beta for the new product and new process. You can see the provisional tree and results in the two slides they provided, below. I apologize for the quality, but it was the best I could do. Haplogroup administrators are going to be heavily involved in this process. Family Tree DNA is putting SNP panels together that will help further define the tree and where various SNPs that have been recently discovered, and continue to be discovered, will fall on the tree. As Big Y tests arrive, haplogroup project administrators typically assemble a spreadsheet of the SNPS and provisionally where they fall on the tree, based on the Big Y results. What Bennett asked is for the admins to work with Family Tree DNA to assemble a testing panel based on those results. The goal is for the cost to be between $1.50 and $2 (US) for each SNP in the panel, which will reduce the one-off SNP testing and provide a much more complete and productive result at a far reduced price as compared to the current $29 or $39 per individual SNP. If you are a haplogroup administrator, get in touch with Family Tree DNA to discuss your desired backbone panels. New panels, when it’s your turn, will take about 2 weeks to develop. Often mutating regions designated as .1, .2, etc. Nir Leibovich, the Chief Business Officer, also addressed the future and the Big Y to some extent in his presentation. In my case, during the last sale, I ordered several Big Y tests for my Estes family line because I have several genealogically documented lines from the original Estes family in Kent, England through our common ancestor, Robert Estes born in 1555 and his wife Anne Woodward. The participants also agreed to extend their markers to 111 markers as well. When the results are back, we’ll be able to compare them on a full STR marker set, and also their SNPs. Hopefully, they will match on their known SNPs and there will be some new novel variants that will be able to suffice as line marker mutations. We need more BIG Y tests of these types of genealogically confirmed trees that have different sons’ lines from a distant common ancestor to test descendant lines. This will help immensely to determine the actual, not imputed, SNP mutation rate and allow us to extrapolate the ages of haplogroups more accurately. Of course, it also goes without saying that it helps to flesh out the trees. I personally expect the next couple of years will be major years of discovery. Yes, the SNP tsumani has hit land, but it’s far from over. David Mittleman, Chief Scientific Officer, mentioned that Family Tree DNA now has their own R&D division where they are focused on how to best analyze data. They have been collaborating with other scientists. A haplogroup G1 paper will be published shortly which states that SNP mutation rates equate to Sanger data. FTDNA wants to get Big Y data into the public domain. They have set up consent for this to be done by uploading into NCBI. Initially they sent a survey to a few people that sampled the interest level. Those who were interested received a release document. If you are interested in allowing FTDNA to utilize your DNA for research, be it mitochondrial, Y or autosomal, please send them an e-mail stating such. It’s very easy for us to get excited about the research and discovery aspect of DNA – and the new SNPs and extending haplotrees back in time as far as possible, but sometimes I get concerned that we are forgetting about the reason we began doing genetic genealogy in the first place. Robert Baber’s presentation discussed the process of how to reconstruct a tree utilizing both genealogy and DNA results. It’s important to remember that the reason most of our participants test is to find their ancestors, not, primarily, to participate in the scientific process. Robert has succeeded in reconstructing 110 or 111 markers of the oldest known Baber ancestor, shown above. I wrote about how to do this in my article titled, Triangulation for Y DNA. Not only does this allow us to compare everyone with the ancestor’s DNA, it also provides us with a tool to fit individuals who don’t know specific genealogical line into the tree relatively accurately. When I say relatively, the accuracy is based on line marker mutations that have, or haven’t, happened within that particular family. Jim illustrated how to do this as well, and his methodology is available at the link on his slide, below. I had to laugh. I’ve often wondered what our ancestors would think of us today. Robert said that that 11 generations after Edward Baber died, he flew over church where Edward was buried and wondered what Edward would have thought about what we know and do today – cars, airplanes, DNA, radio, TV etc.. If someone looked in a crystal ball and told Edward what the future held 11 generations later, he would have thought that they were stark raving mad. Eleven generations from my birth is roughly the year 2280. I’m betting we won’t be trying to figure out who our ancestors were through this type of DNA analysis then. This is only a tiny stepping stone to an unknown world, as different to us as our world is to Edward Baber and all of our ancestors who lived in a time where we know their names but their lives and culture are entirely foreign to ours. When the Journal of Genetic Genealogy was active, I, along with other citizen scientists published regularly. The benefit of the journal was that it was peer reviewed and that assured some level of accuracy and because of that, credibility, and it was viewed by the scientific community as such. My co-authored works published in JOGG as well as others have been cited by experts in the academic community. It other words, it was a very valuable journal. Sadly, it has fallen by the wayside and nothing has been published since 2011. A new editor was recruited, but given their academic load, they have not stepped up to the plate. For the record, I am still hopeful for a resurrection, but in the mean time, another opportunity has become available for genetic genealogists. Brad Larkin has founded the Surname DNA Journal, which, like JOGG, is free to both authors and subscribers. In case you weren’t aware, most academic journal’s aren’t. While this isn’t a large burden for a university, fees ranging from just over $1000 to $5000 are beyond the budget of genetic genealogists. Just think of how many DNA tests one could purchase with that money. Brad has issued a call for papers. These papers will be peer reviewed, similarly to how they were reviewed for JOGG. Take a look at the articles published in this past year, since the founding of Surname DNA Journal. The citizen science community needs an avenue to publish and share. Peer reviewed journals provide us with another level of credibility for our work. Sharing is clearly the lynchpin of genetic genealogy, as it is with traditional genealogy. Give some thought about what you might be able to contribute. Brad Larkin solicited nominations prior to the conference and awarded a Genetic Genealogist of the Year award. This year’s award was dually presented to Ian Kennedy in Australia, who, unfortunately, was not present, and to CeCe Moore, who just happened to follow Brad’s presentation with her own. I believe that mitochondrial DNA the most underutilized DNA tool that we have, often because how to use mitochondrial DNA, and what it can tell you, is poorly understood. I wrote about this in an article titled, Mitochondrial, The Maligned DNA. Given that I work with mitochondrial DNA daily when I’m preparing client’s Personalized DNA Reports (orderable from your personal page at Family Tree DNA or directly from my website), I know just how useful mitochondrial can be and see those examples regularly. Unfortunately, because these are client reports, I can’t write about them publicly. CeCe Moore, however, isn’t constrained by this problem, because one of the ways she contributes to genetic genealogy is by working with the television community, in particular Genealogy Roadshow and the PBS series, Finding Your Roots. Now, I must admit, I was very surprised to see CeCe scheduled to speak about mitochondrial DNA, because the area of expertise where she is best known is autosomal DNA, especially in conjunction with adoptee research. During the research for the production of these shows, CeCe has utilized mitochondrial DNA with multiple celebrities to provide information such as the ethnic identification of the ancestor who provided the mitochondrial DNA as Native American. Autosomal DNA testing has a broad but shallow reach, across all of your lines, but just back a few generations. Both Y and mitochondrial DNA have a very deep reach, but only on one specific line, which makes them excellent for identifying a common ancestor on that line, as well as the ethnicity of that individual. I have seen other cases, where researchers connected the dots between people where no paper trail existed, but a relationship between women was suspected. CeCe mentioned that currently there are only 44,000 full sequence results in the Family Tree DNA data base and and 185K total HVR1, HVR2 and full sequence tests. Y has half a million. We need to increase the data base, which, of course increases matches and makes everyone happier. If you haven’t tested your mitochondrial DNA to the full sequence level, this would be a great time! There are several lessons on how to utilize mitochondrial DNA at this ISOGG link. I’m very hopeful that CeCe’s presentation will be made available as I think her examples are quite powerful and will serve to inspire people. Actually, since CeCe is in the “movie business,” perhaps a short video clip could be made available on the FTDNA website for anyone who hasn’t tested their mitochondrial DNA so they can see an example of why they should! I would be fibbing to you if I told you I am happy with myOrigins. I don’t feel that it is as sensitive as other methods for picking up minority admixture, in particular, Native American, especially in small amounts. Unfortunately, those small amounts are exactly what many people are looking for. If someone has a great-great-great-great grandparent that is Native, they carry about 1%, more or less, of the Native ancestor’s DNA today. A 4X great grandparent puts their birth year in the range of 1800-1825 – or just before the Trail of Tears. People whose colonial American families intermarried with Native families did so, generally, before the Trail of Tears. By that time, many tribes were already culturally extinct and those east of the Mississippi that weren’t extinct were fighting for their lives, both literally and figuratively. We really need the ability to develop the most sensitive testing to report even the smallest amounts of Native DNA and map those segments to our chromosomes so that we can determine who, and what line in our family, was Native. I know that Family Tree DNA is looking to improve their products, and I provided this feedback to them. Many people test autosomally only for their ethnicity results and I surely would love to have those people’s results available as matches in the FTDNA data base. Razib Khan has been working with Family Tree DNA on their myOrigins product and spoke about how the myOrigins data is obtained. Given that all humans are related, one way or another, far enough back in time, myOrigins has to be able to differentiate between groups that may not be terribly different. Furthermore, even groups that appear different today may not have been historically. His own family, from India, has no oral history of coming from the East, but the genetic data clearly indicates that they did, along with a larger group, about 1000 years ago. This may well be a result of the adage that history is written by the victors, or maybe whatever happened was simply too long ago or unremarkable to be recorded. Razib mentioned that depending on the cluster and the reference samples, that these clusters and groups that we see on our myOrigins maps can range from 1000-10,000 years in age. The good news is that genetics is blind to any preconceived notions. The bad news is that the software has to fit your results to the best population, even though it may not be directly a fit. Hopefully, as we have more and better reference populations, the results will improve as well. Razib showed a PCA (principal components analysis) graph, above. These graphs chart reference populations in different quadrants. Where the different populations overlap is where they share common historic ancestors. As you can see, on this graph with these reference populations, there is a lot of overlap in some cases, and none in others. Your personal results would then be plotted on top of the reference populations. The graph below shows me, as the white “target” on a PCA graph created by Doug McDonald. 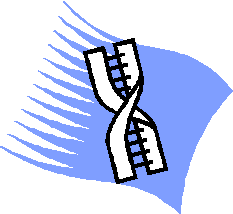 A topic discussed privately among the group, and primarily among the bloggers, is the changing landscape of genetic genealogy over the past year or so. In many ways I think the bloggers are the canaries in the mine. One thing that clearly happened is that the proverbial tipping point occurred, and we’re past it. DNA someplace along the line became mainstream. Today, DNA is a household word. At gatherings, at least someone has tested, and most people have heard about DNA testing for genealogy or at least consumer based DNA testing. The good news in all of this is that more and more people are testing. The bad news is that they are typically less informed and are often impulse purchasers. This gives us the opportunity for many more matches and to work with new people. It also means there is a steep learning curve and those new testers often know little about their genealogy. Those of us in the “public eye,” so to speak, have seen an exponential spike in questions and communications in the past several months. Unfortunately, many of the new people don’t even attempt to help themselves before asking questions. Sometimes opportunity comes with work clothes – for them and us both. I had to laugh, because this falls clearly into the “be careful what you wish for, you may get it” category. The Genographic project through National Geographic is clearly, very clearly, a critical component of the tipping point, and this was reflected in Spencer’s presentation. Although I covered quite a bit of Spencer’s presentation in my day 2 summary, I want to close with Spencer here. I also want to say that if you ever have the opportunity to hear Spencer speak, please do yourself the favor and be sure to take that opportunity. Not only is he brilliant, he’s interesting, likeable and very approachable. Of course, it probably doesn’t hurt that I’ve know him now for 9 years! I’ve never thought to have my picture taken with Spencer before, but this time, one of my friends did me the favor. I’m warning you all now, if I win the lottery, I’m going on the world tour that he hosts with National Geographic, and of course, you’ll all be coming with me via the blog! Spencer talked about the consumer genomics market and where we are today. So, where exactly are we today? In 2013, the industry crossed the millionth kit line. The second millionth kit was sold in early summer 2014 and the third million will be sold in 2015. No wonder we feel like a tidal wave has hit. It has. DNA has become part of national consciousness. Businesses advertise that “it’s in our DNA.” People are now comfortable sharing via social media like facebook and twitter. What DNA can do and show you, the secrets it can unlock is spreading by word of mouth. Spencer termed this the “viral spread threshold” and we’ve crossed that invisible line in the sand. He terms 2013 as the year of infection and based on my blog postings, subscriptions, hits, reach and the number of e-mails I receive, I would completely agree. Hold on tight for the ride! Spencer sees a huge international market potential that is not currently being tapped. I do agree with him, but many in European countries are hesitant, and in some places, like France, DNA testing that might expose paternity is illegal. When Europeans see DNA testing as a genealogical tool, he feels they will become more interested. Most Europeans know where their ancestral village is, or they think they do, so it doesn’t have the draw for them that it does for some of us. Ancestry testing (aka genetic genealogy as opposed to health testing) is now a mature industry with 100% growth rate. Spencer also mentioned that while the Genographic data base is not open access, that affiliate researchers can send Nat Geo a proposal and thereby gain research access to the data base if their proposal is approved. This extends to citizen scientists as well. You’ll notice that Michael Hammer’s presentation, “Ancient and Modern DNA Update, How Many Ancestral Populations for Europe,” is missing from this wrapup. It was absolutely outstanding, and fascinating, which is why I’m writing a separate article about his presentation in conjunction with some additional information. So, stay tuned. It’s becoming quite obvious that the people who are doing the best with genetic genealogy are the ones who are testing the most family members, both close and distant. That provides them with a solid foundation for comparison and better ways to “drop matches” into the right ancestor box. For example, if someone matches you and your mother’s sister, Aunt Margaret, especially if your mother is not available to test, that’s a very important hint that your match is likely from your mother’s line. So, in essence, while initially we would advise people to test the oldest person in a generational line, now we’ve moved to the “test everyone” mentality. Instead of a survey, now we need a census. The exception might be that the “child” does not necessarily need to be tested because both parents have tested. However, having said that, I would perhaps not make that child’s test a priority, but I would eventually test that child anyway. Why? Because that’s how we learn. Let me give you an example. I was sitting at lunch with David Pike. were discussing autosomal DNA generational transmission and inheritance. He pulled out his iPad, passed it to me, and showed me a chromosome (not the X) that has been passed entirely intact from one generation to the next. Had the child not been tested, we would never have known that. Now, of course, if you’ll remember the 50% rule, by statistical prediction, the child should get half of the mother’s chromosome and half of the father’s, but that’s not how it worked. So, because we don’t know what we don’t know, I’m now testing everyone I can find and convince in my family. Unfortunately, my family is small. Full genome testing is in the future, but we’re not ready yet. Several presenters mentioned full genome testing in some context. Here’s the bottom line. It’s not truly full genome testing today, only 95-96%. The technology isn’t there yet, and we’re still learning. 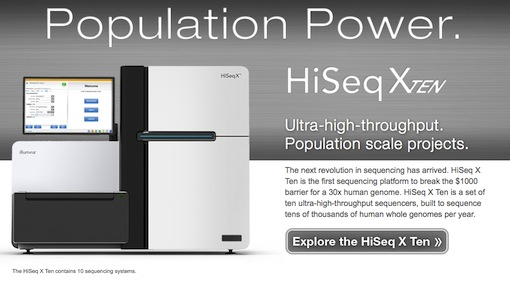 In a couple of years, we will have the entire genome available for testing, and over time, the prices will fall. Keep in mind that most of our genome is identical to that of all humans, and the autosomal tests today have been developed in order to measure what is different and therefore useful genealogially. I don’t expect big breakthroughs due to full genome testing for genetic genealogy, although I could be wrong. You can, however, count me in, because I’m a DNA junkie. When the full genome test is below $1000, when we have comparison tools and when the coverage won’t necessitate doing a second or upgrade test a few years later, I’ll be there. I want to offer a heartfelt thank you to Max Blankfeld and Bennett Grenspan, founders of Family Tree DNA, shown with me in the photo below, for hosting and subsidizing the administrator’s conference – now for a decade. I look forward to seeing them, and all of the other attendees, next year. I anticipate that this next decade will see many new discoveries resulting in tools that make our genealogy walls fall. I can’t help but wonder what the article I’ll be writing on the 20th anniversary looking back at nearly a quarter century of genetic genealogy will say! The good news is that my three articles about the Anzick and other ancient DNA of the past few days have generated a lot of interest. The bad news is that it has generated hundreds of e-mails every day – and I can’t possibly answer them all personally. So, if you’ve written me and I don’t reply, I apologize and I hope you’ll understand. Many of the questions I’ve received are similar in nature and I’m going to answer them in this article. In essence, people who have matches want to know what they mean. Q – I had a match at GedMatch to <fill in the blank ancient DNA sample name> and I want to know if this is valid. A – Generally, when someone asks if an autosomal match is “valid,” what they really mean is whether or not this is a genealogically relevant match or if it’s what is typically referred to as IBS, or identical by state. Genealogically relevant samples are referred to as IBD, or identical by descent. I wrote about that in this article with a full explanation and examples, but let me do a brief recap here. In genealogy terms, IBD is typically used to mean matches over a particular threshold that can be or are GENEALOGICALLY RELEVANT. Those last two words are the clue here. In other words, we can match them with an ancestor with some genealogy work and triangulation. If the segment is large, and by that I mean significantly over the threshold of 700 SNPs and 7cM, even if we can’t identify the common ancestor with another person, the segment is presumed to be IBD simply because of the math involved with the breakdown of segment into pieces. In other words, a large segment match generally means a relatively recent ancestor and a smaller segment means a more distant ancestor. You can readily see this breakdown on this ISOGG page detailing autosomal DNA transmission and breakdown. Unfortunately, often smaller segments, or ones determined to be IBS are considered to be useless, but they aren’t, as I’ve demonstrated several times when utilizing them for matching to distant ancestors. That aside, there are two kinds of IBS segments. One kind of IBS segment is where you do indeed share a common ancestor, but the segment is small and you can’t necessarily connect it to the ancestor. These are known as population matches and are interpreted to mean your common ancestor comes from a common population with the other person, back in time, but you can’t find the common ancestor. By population, we could mean something like Amish, Jewish or Native American, or a country like Germany or the Netherlands. In the cases where I’ve utilized segments significantly under 7cM to triangulate ancestors, those segments would have been considered IBS until I mapped them to an ancestor, and then they suddenly fell into the IBD category. As you can see, the definitions are a bit fluid and are really defined by the genealogy involved. So, in a nutshell, if you know who your common ancestor is on a segment match with someone, you are IBD, identical by descent. If you don’t know who your common ancestor is, and the segment is below the normal threshold, then you are generally considered to be IBS – although that may or may not always be true. There is no way to know if you are truly IBS by population or IBS by convergence, with the possible exception of phased data. Data phasing is when you can compare your autosomal DNA with one or both parents to determine which half you obtained from whom. If you are a match by convergence where your DNA run matches that of someone else because the combination of your parents DNA happens to match their segment, phasing will show that clearly. Here’s an example for only one location utilizing only my mother’s data phased with mine. My father is deceased and we have to infer his results based on my mother’s and my own. In other words, mine minus the part I inherited from my mother = my father’s DNA. In this example of just one location, you can see that I carry a T and an A in that location. My mother carries a T and a G, so I obviously inherited the T from her because I don’t have a G. Therefore, my father had to have carried at least an A, but we can’t discern his second value. This example utilized only one location. Your autosomal data file will hold between 500,000 and 700,000 location, depending on the vendor you tested with and the version level. You can phase your DNA with that of your parent(s) at GedMatch. However, if both of your parents are living, an easier test would be to see if either of your parents match the individual in question. If neither of your parents match them, then your match is a result of convergence or a data read error. So, this long conversation about IBD and IBS is to reach this conclusion. All of the ancient specimens are just that, ancient, so by definition, you cannot find a genealogy match to them, so they are not IBD. Best case, they are IBS by population. Worse case, IBS by convergence. You may or may not be able to tell the difference. The reason, in my example earlier this week, that I utilized my mother’s DNA and only looked at locations where we both matched the ancient specimens was because I knew those matches were not by convergence – they were in fact IBS by population because my mother and I both matched Anzick. Q – What does this ancient match mean to me? A – Doggone if I know. No, I’m serious. Let’s look at a couple possibilities, but they all have to do with the research you have, or have not, done. If you’ve done what I’ve done, and you’ve mapped your DNA segments to specific ancestors, then you can compare your ancient matching segments to your ancestral spreadsheet map, especially if you can tell unquestionably which side the ancestral DNA matches. In my case, shown above, the Clovis Anzik matched my mother and me on the same segment and we both matched Cousin Herbie. We know unquestionably who our common ancestor is with cousin Herbie – so we know, in our family line, which line this segment of DNA shared with Anzick descends through. Maybe this is a good reason to start ancestor mapping! This article tells you how to get started. No, this match alone does not prove Native American heritage, especially not at IBS levels. In fact, many people who don’t have Native heritage match small segments? How can this be? Well, refer to the IBS by convergence discussion above. In addition, Anzick child came from an Asian population when his ancestors migrated, crossing from Asia via Beringia. That Eurasian population also settled part of Europe – so you could be matching on very small segments from a common population in Eurasia long ago. In a paper just last year, this was discussed when Siberian ancient DNA was shown to be related to both Native Americans and Europeans. In some cases, a match to Anzick on a segment already attributed to a Native line can confirm or help to confirm that attribution. In my case, I found the Anzick match on segments in the Lore family who descend from the Acadians who were admixed with the Micmac. I have several Anzick match segments that fit that criteria. A match to Anzick alone doesn’t prove anything, except that you match Anzick, which in and of itself is pretty cool. Q – I’m European with no ancestors from America, and I match Anzick too. How can that be? A – That’s really quite amazing isn’t it. Just this week in Nature, a new article was published discussing the three “tribes” that settled or founded the European populations. This, combined with the Siberian ancient DNA results that connect the dots between an ancient population that contributed to both Europeans and Native Americans explains a lot. If you think about it, this isn’t a lot different than the discovery that all Europeans carry some small amount of Neanderthal and Denisovan DNA. Well, guess what….so does Anzick. Here are his matches to the Altai Neanderthal. He does not match the Caucasus Neanderthal. He does, however, match the Denisovan individual on one location. Q – Maybe the scientists are just wrong and the burial is not 12,500 years old, maybe just 100 years old and that’s why the results are matching contemporary people. 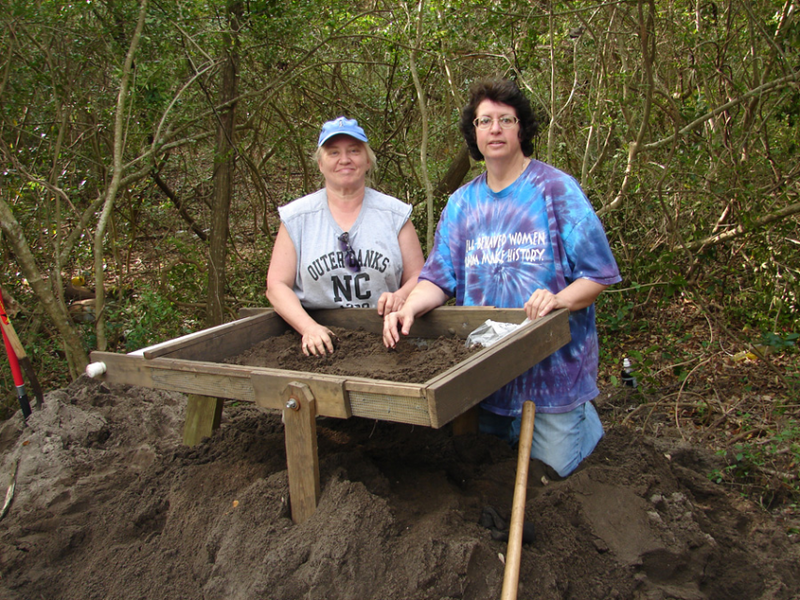 A – I’m not an archaeologist, nor do I play one…but I have been closely involved with numerous archaeological excavations over the past decade with The Lost Colony Research Group, several of which recovered human remains. The photo below is me with Anne Poole, my co-director, sifting at one of the digs. There are very specific protocols that are followed during and following excavation and an error of this magnitude would be almost impossible to fathom. It would require kindergarten level incompetence on the part of not one, but all professionals involved. In the Montana Anzick case, in the paper itself, the findings and protocols are both discussed. First, the burial was discovered directly beneath the Clovis layer where more than 100 tools were found, and the Clovis layer was undisturbed, meaning that this is not a contemporary burial that was buried through the Clovis layer. Second, the DNA fragmentation that occurs as DNA degrades correlated closely to what would be expected in that type of environment at the expected age based on the Clovis layer. Third, the bones themselves were directly dated using XAD-collagen to 12,707-12,556 calendar years ago. Lastly, if the remains were younger, the skeletal remains would match most closely with Native Americans of that region, and that isn’t the case. This graphic from the paper shows that the closest matches are to South Americans, not North Americans. This match pattern is also confirmed independently by the recent closest GedMatch matches to South Americans. Q – How can this match from so long ago possibly be real? What this means is that the population at one time, and probably at several different times, had to be very small. In fact, it’s very likely that many times different pockets of the human race was in great jeopardy of dying out. We know about the ones that survived. Probably many did perish leaving no descendants today. For example, no Neanderthal mitochondrial DNA has been found in any living or recent human. In a small population, let’s say 5 males and 5 females who some how got separated from their family group and founded a new group, by necessity. In fact, this could well be a description of how the Native Americans crossed Beringia. Those 5 males and 5 females are the founding population of the new group. If they survive, all of the males will carry the men’s haplogroups – let’s say they are Q and C, and all of the descendants will carry the mitochondrial haplogroups of the females – let’s say A, B, C, D and X. There is a very limited amount of autosomal DNA to pass around. If all of those 10 people are entirely unrelated, which is virtually impossible, there will be only 10 possible combinations of DNA to be selected from. Within a few generations, everyone will carry part of those 10 ancestor’s DNA. We all have 8 ancestors at the great-grandparent level. By the time those original settlers’ descendants had great-great-grandparents – of which each one had 16, at least 6 of those original people would be repeated twice in their tree. There was only so much DNA to be passed around. In time, some of the segments would no longer be able to be recombined because when you look at phasing, the parents DNA was exactly the same, example below. This is what happens in endogamous populations. Let’s say this group’s descendants lived without contact with other groups, for maybe 15,000 years in their new country. That same DNA is still being passed around and around because there was no source for new DNA. Mutations did occur from time to time, and those were also passed on, of course, but that was the only source of changed DNA – until they had contact with a new population. When they had contact with a new population and admixture occurred, the normal 50% recombination/washout in every generation began – but for the previous 15,000 years, there had been no 50% shift because the DNA of the population was, in essence, all the same. A study about the Ashkenazi Jews that suggests they had only a founding population of about 350 people 700 years ago was released this week – explaining why Ashkenazi Jewish descendants have thousands of autosomal matches and match almost everyone else who is Ashkenazi. I hope that eventually scientists will do this same kind of study with Anzick and Native Americans. If the “new population” we’ve been discussing was Native Americans, their males 15,000 year later would still carry haplogroups Q and C and the mitochondrial DNA would still be A, B, C, D and X. Those haplogroups, and subgroups formed from mutations that occurred in their descendants, would come to define their population group. In some cases, today, Anzick matches people who have virtually no non-Native admixture at the same level as if they were just a few generations removed, shown on the chart below. Since, in essence, these people still haven’t admixed with a new population group, those same ancient DNA segments are being passed around intact, which tells us how incredibly inbred this original small population must have been. This is known as a genetic bottleneck. The admixture report below is for the first individual on the Anzick one to all Gedmatch compare at 700 SNPs and 7cM, above. In essence, this currently living non-admixed individual still hasn’t met that new population group. If this “new population” group was Neanderthal, perhaps they lived in small groups for tens of thousands of years, until they met people exiting Africa, or Denisovans, and admixed with them. There weren’t a lot of people anyplace on the globe, so by virtue of necessity, everyone lived in small population groups. Looking at the odds of survival, it’s amazing that any of us are here today. But, we are, and we carry the remains, the remnants of those precious ancestors, the Denisovans, the Neanderthals and Anzick. Through their DNA, and ours, we reach back tens of thousands of years on the human migration path. Their journey is also our journey. It’s absolutely amazing and it’s no wonder people have so many questions and such a sense of enchantment. But it’s true – and only you can determine exactly what this means to you. A new study released by Howard Hughes Medical Institute at Harvard Medical School on January 29th titled “When Populations Collide” provides some interesting insights about Neanderthal DNA in modern humans. This study compared the full Neanderthal genome to that of 1004 living individuals. In general, people in East Asia carry more Neanderthal than Europeans who carry 1-3%, and Africans carry none or very little. It appears, according to David Reich, that Neanderthal DNA is not proportionately represented in contemporary humans, meaning that some areas of Neanderthal DNA are commonly found and others not at all. Some Neanderthal genes are carried by more than 60% of Europeans or Asians, most often associated with skin and hair color, or keratin. Reich’s thought is that people exiting Africa assimilated with Neanderthals and selected for these genes that gave them an adaptive and survival advantage in the cooler non-African climate. Given the recent discussions about the X chromosome and the possibility that it may be inherited in an all-or-nothing manner more often than the other chromosomes, I had to wonder how they determined that this was hybrid sterility and not an case of absence of recombination. Reich’s team apparently had the same question, so they evaluated the genes related to the function of the testes, confirming they too had a particularly low inheritance frequency of Neanderthal DNA. These, combined, would eventually cause the X to be present in very small quantities in the genome of descendants since the Neanderthal X could only be inherited from women and then would cause the resulting males to be sterile. So in essence, only females could pass the X on and only their daughters would pass it further. Males carrying that X not only wouldn’t pass the X, they wouldn’t pass anything at all due to sterility. If, in addition to this, the X has unusual recombination features, that could exacerbate the situation. Conversely, if the X is inherited intact more often than not at all, it could increase the likelihood of the X being brought forward in the population. Reich says his team is now focused on looking at Neanderthal DNA and human disease genes. He says that his new study revealed that lupus, diabetes and Crohn’s Disease likely originate from Neanderthals. Another study, published the same day in Science titled “Resurrecting Surviving Neandertal Lineages from Modern Human Genomes,” reaches the same conclusions about the Neanderthal inherited traits related to skin color. This study compared the full genomes of 379 East Asians and 286 Europeans to Neanderthal genomes and discovered that they could map about 20% of the Neanderthal DNA in those individuals today. This, conversely, means that 80% of the Neanderthal genome is missing, so either truly missing or simply missing in the people whose DNA they sequenced. It will be interesting to see what is found as more contemporary genetic sequences are compared against Neanderthal, and as more Neanderthal DNA is found and sequenced. Fortunately, recent advances in dealing with contaminated ancient DNA hold a great deal of promise in terms of increasing our ability to sequence DNA that was previously thought to be useless. This report is described in the article “Separating endogenous ancient DNA from modern day contamination in a Siberian Neanderthal” and was used in the sequencing and analysis of the Neanderthal toe bone found in Siberia. 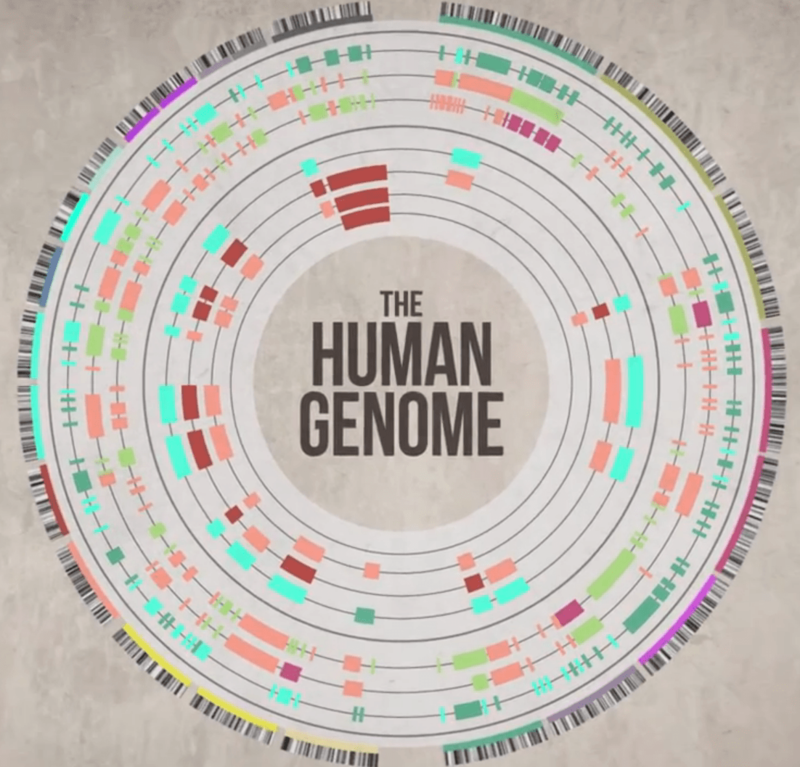 This is a great, short, TED Ed tutorial about the mechanics of sequencing the human genome. One of my cousins sent it along – thanks Howard!! !